Sweet Potato Spinach Egg Boat: Eggs, spinach and tomatoes are baked into a tender baked sweet potato, for a delicious twist on a breakfast quiche. I am obsessed with sweet potato recipes. I will eat them in oatmeal, in smoothies, in bean burritos, and even as nachos. And because I also love easy breakfast recipes, I had the genius idea to fill one of my all time favorite foods with my favorite omelet combination. And let me tell you-It ROCKED my world. Talk about a healthy breakfast! 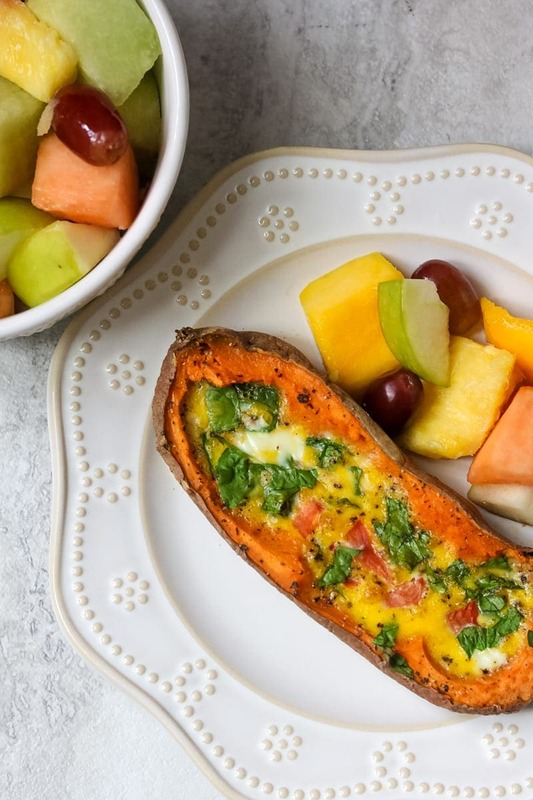 These sweet potatoes stuffed with baked eggs are high in protein, low in fat, high in fiber, high in vitamins and nutrients and happen to be gluten-free and paleo. 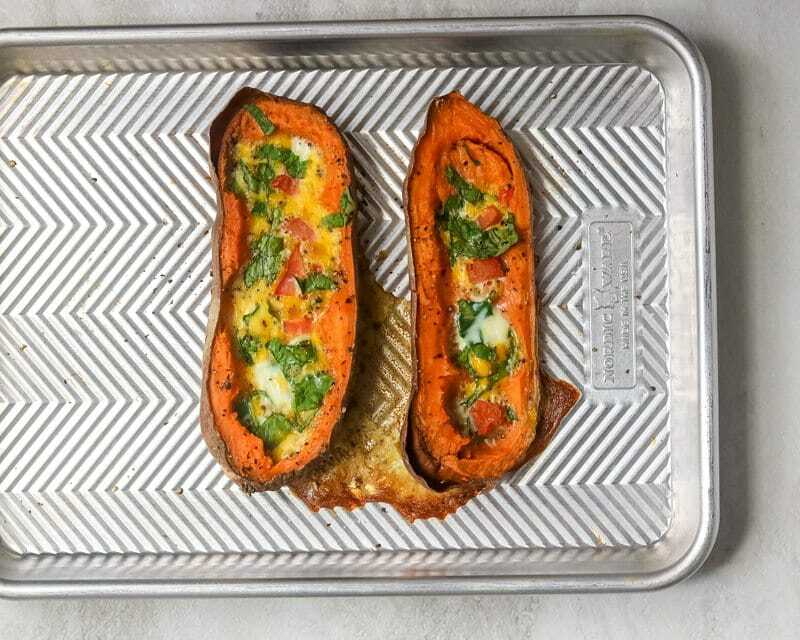 And these Baked Sweet Potatoes with Eggs could not be easier to make! Therefore is sure to become a favorite at your house as well. Step One: Start with a pre-baked sweet potato. 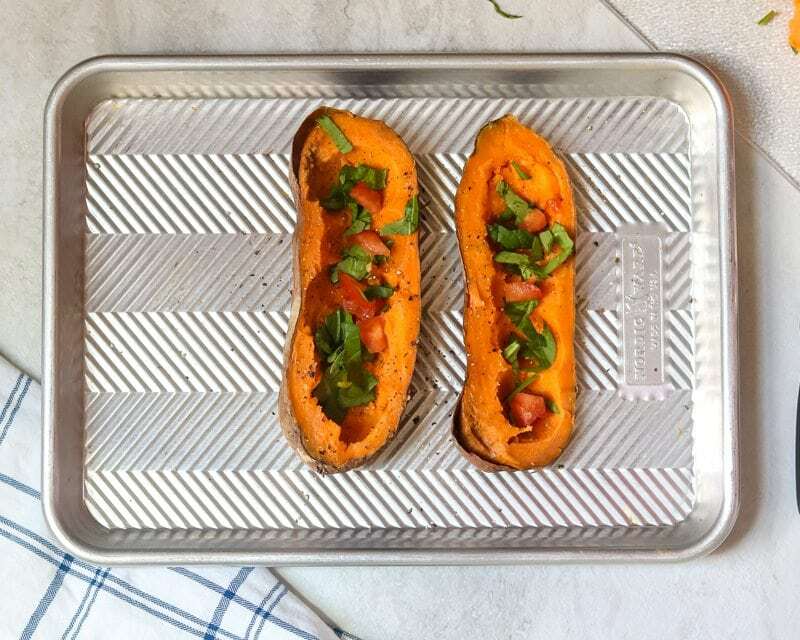 I suggest throwing in some sweet potatoes in the oven or instant pot the night before while you are making dinner and let them cool and refrigerate until ready to use. Step Two: Cut the potato in half and scoop out the middle portion of the potato–leaving a bit of flesh intact around the edges and bottom of potato. 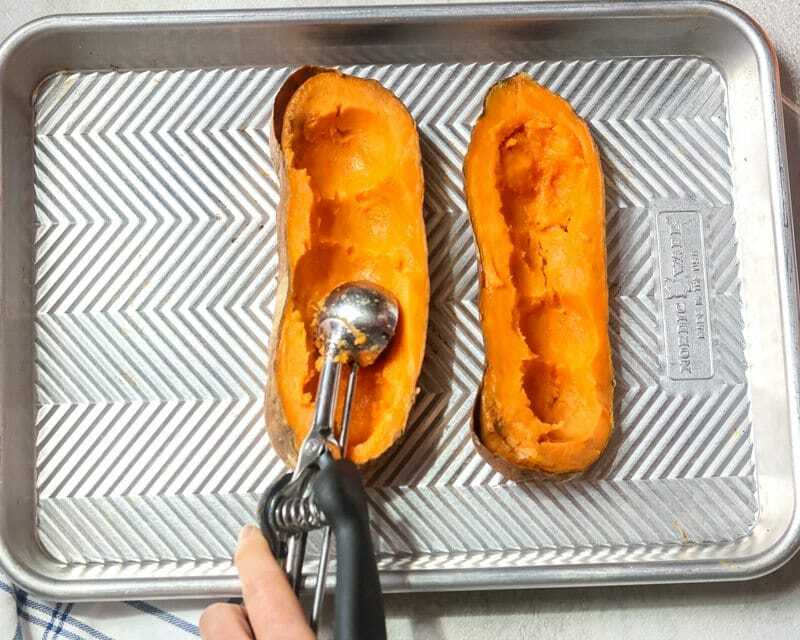 I like to use a mini cookie scoop or melon baller, but a spoon will work, just be careful to leave some sweet potato flesh inside the sweet potato. Step Three: Season each sweet potato half with salt and pepper and sprinkle with tomatoes and spinach. If you are not whole 30 or Paleo, add in some feta cheese as well for taste. Step Four: Mix together egg with salt and pepper and milk or water. If you like whole eggs, feel free to crack your egg directly into your sweet potato half, but if you have a longer sweet potato, as pictured here, your egg may not spread out sufficiently to cover your sweet potato’s surface. Step Five: Carefully pour egg mixture into well of potato. Step Six Bake at 400 degrees for 15-20 minutes until egg is set. You can also broil, but will need to watch carefully after 5 minutes. Baked eggs in sweet potatoes can be customized ANYWAY you want! You can use white potatoes as well. And let the egg filling be anything you like in omelets–ham and cheese, sausage and peppers, mushrooms and onions….the list goes on and on. What a great way to feed a bunch of palates–every family member’s Potato Egg Boat can be customized just the way they want it. DON’T Throw away the filling of the potatoes!! The baked sweet potato is a great addition to Sweet Potato Oatmeal, Sweet Potato Casserole, or Sweet Potato Pancakes. If you are using white potatoes, that extra potato filliing would be great in Crispy Creamy Potato Pancakes. To keep these Spinach Egg Bakes paleo and whole-30 approved, omit feta cheese. If you are using smaller sweet potatoes for this recipe, you may only need 2-3 eggs. If you have leftover egg custard, just scramble up for another day. Now grab a fork and dig into a gluten-free, protein-filled egg breakfast that is a boat of deliciousness! A tender sweet potato is filled with eggs, spinach and tomatoes for an easy, healthy breakfast. 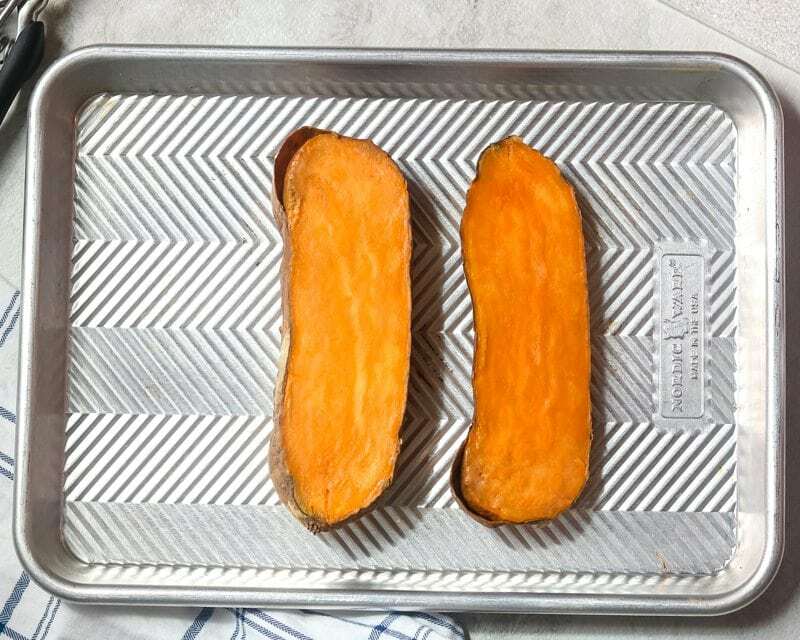 Cut baked sweet potatoes in half and carefully scoop out the center of each half, leaving a about 1/2 inch border of sweet potato left. Sprinkle each half with salt and pepper (use about 1/2 teaspoon of each total). Divide spinach, tomato, and feta if using evenly between each sweet potato half. Mix together eggs with remaining 1/2 teaspoon each of salt and pepper and water or milk. Carefully pour into whisked eggs into sweet potato halves. Feel free to crack each egg directly into each half of the potato--if you would prefer your eggs to not be scrambled. These look so tasty! We could eat sweet potatoes all day long!! Me too! They are great in so many dishes! These are perfect! I want to dive right into one of those boats! It’s an explosion of my favorite foods. Love it! I’m pretty much obsessed by sweet potatoes and love eggs for dinner, so this is a perfect meal for me. Yes! You will love this!! I love this idea, such a great combination of wonderful flavors! Thanks! They are all my favorite! The contrast between the salty feta and the sweet potato sounds perfect. A great dish for brunch with friends if you, as recommended, bake off the potatoes the night before. Oh, I want to have a brunch party now! Gosh, this is soooo my kind of food. Anything with egg and spinach and you used a sweet potato as a vessel–brilliant! I have a few of them sitting on my counter so you just gave me a great idea how to use them up! Wonderful!! So happy to inspire you! Love this! Great quick and easy meal for the kids too! Exactly. My kids like their eggs with just feta. And a spinach salad on the side–how can I can complain about that?! The sweet potatoes I get from the farm share may taste wonderful, but they are all gnarly-shaped. Even though I miss the weekly box of veggies during the winter, I’m looking forward to finishing up my farm share sweet potatoes–only a handful left after all the recipes I made this week. This idea is a great one, and I want to try it with fat store bought sweet potatoes so I can hold more feta! Oh, there is nothing better than fresh farm produce, but I hear ya—the fat sweet potatoes are best because the more feta the better! heck to the yes this looks good! This is perfect for me!! 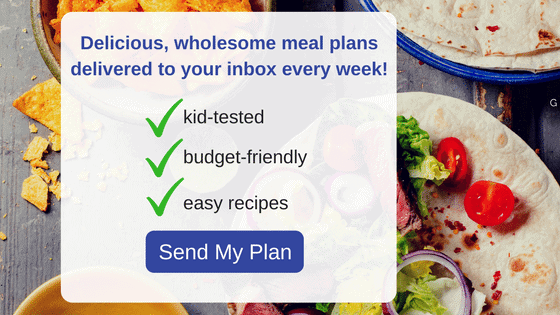 I love how easy and healthy it is! I am glad you think you will enjoy this dish! It is one of my favorites! I love sweet potatoes, what a great idea to stuff them with omelet, sounds delicious! What a creative idea! I could easily eat this for dinner. Great recipe! It is a perfect dinner option! This idea is amazing!! Sweet potato is my fave food too, and filling it with an omelette is just genius! It is so great Michelle. We are big fans of sweet potato in our house too, and funny enough I was thinking about filled versions recently as well. These look great! 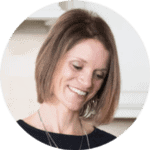 Great minds think alike, Caroline–you will love them! I don’t think there has ever been a sweet potato I didn’t like–I bet you will love this too! What a great idea, Kristen! 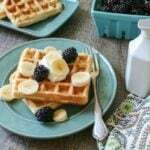 I think I am going to try this for breakfast for my kids in the fall too…I think they’ll love it and what a great way to start the day! This would rock my world, too! I need to try this soon!! I sure hope you do Rebecca! What a yummy, healthy meal for ANY time of day!!! I love sweet potato and spinach, both give rich flavors and this looks tasty. Egg boats are the BEST! These look amazing! I love these flavors! I wish I had this for breakfast, yum! I always get excited when I can call that breakfast! These Baked Eggs in Sweet Potatoes absolutely something new for me! Looks yummy! I’m also gonna pin this post on my Pinterest board my followers will love it. Thx for sharing recipe, I definitely add it to my cookbook! 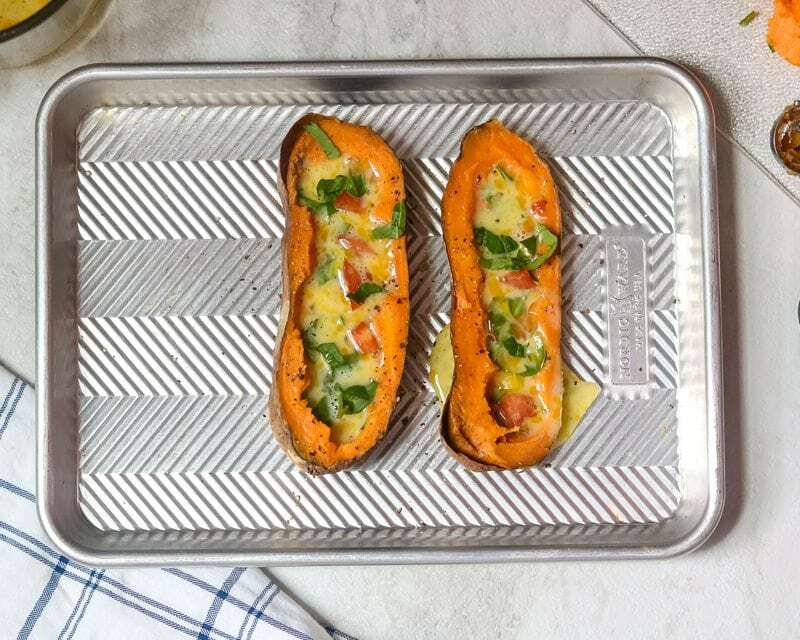 These sweet potato spinach egg boats are so Instagrammable and adorable! As you know I made it a short while ago and it was lovely! Thx for sharing!